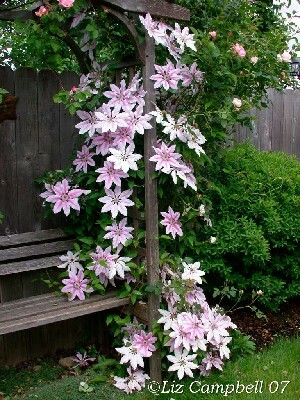 This old time favorite should be in every garden. It has large pale Pink flowers with a deep bright pink bar. Will fade in strong sun. Dark reddish-purple anthers make this one get noticed.RHS Award of Garden Merit in 1993. Large deep burgundy Red flowers with a bright yellow center. You can prune Niobe as either a type 2 or 3. RHS award of garden merit. Shown here with 'Josephine'. Niobe preforms great treated like a type 3 hard prune as well.